Happy Halloween everyone! So, I didn’t intend on taking more than a week blog break again but, it’s fall and things are busy. But one of the things I was busy with was my Halloween costume! Friends of mine know that I’m not very Halloween-friendly. Maybe it’s because I’m more of a Christmas and Thanksgiving kind of girl but I’m very lacking in the Halloween-creative department. Basically, I don’t dress in costume. Or my costume are scrubs (instant nurse!) or a hot pink wig that I pretend makes me a punk girl (it doesn’t) and my creative friends shake their head in semi-disgust. But this year, I decided to do something new…TRY to put a costume together. Clear the aisles and exit rows! I don’t like to toot my own horn but OMG it came together so well. And with a little back combing, I thought I looked pretty good. People even thought I was a real stewardess, but they might have been drunk. I really wish I had more pictures to share but I didn’t take any! BAD JESS! But thanks to Jessi (photo courtesy of her) for being an amazing photographer and providing me with some photographic proof of my costume skillz. And to enhance the costume, I got little wine shooters and almond bags to hand out. 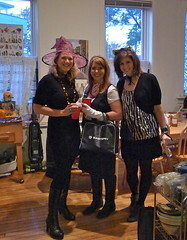 I don’t know if I’ll be as proactive on costumes next year, but it was kind of fun, I’ll admit that. What what? That’s right, time for another edition of Single Girl Confidential, my super awesome joint project with the lovely Arielle. Let’s see, to date, we’ve posted about topics relevant to singles, such as honest online dating profiles, why being single makes me fat and my take on a recent Times’ Modern Love column. So what’s next? Secret single behavior. Time to pull back the curtain to Oz and disclose some of my quirky behaviors that I will admit I do as a singleton but would not do in a relationship. Objectifying men – This is one of my favorites. To keep my mind sharp, I try to objectify at least one man a day. Sometimes, I have to double up if I’m working from home or can’t find someone good. And sometimes, my objectification is cleaner than others, depending on my mood. Also, if they smell good, I may lean in a bit to give them a sniff. Wasting a chance to sniff a nice smelling man is a terrible thing. In hindsight, these seem a bit tame. Guess I’ll have to up my game. But before I go out on weekends or if I go out on a date, I do make sure my clothes are picked up because if someone is invited up and a bra is laying on the bed again, that’s not a good first impression. Be sure to check out Arielle’s post too about her Secret Single Behaviors. One is really hilarious. My favorite day of the week is Friday. Not only because it’s the weekend, but also because it’s TREAT FRIDAY. I coined this phrase to describe my Friday mentality at work. Yes, I still get work done but it’s also about treating myself right. I’m adamant about packing my lunch Monday-Thursday so Friday is treat day. I buy lunch (and maybe dessert!!!) and just do nice stuff for me. Why? Because it’s TREAT FRIDAY! Woooooo! Then, I watched Parks and Rec last week and saw Tom and Donna celebrate Treat Yo Self Day. Seriously, seeing this made my day. It’s like Treat Friday on crack. So Saturday, to try and boost my spirits, I had a mini Treat Yo Self day myself. Dior red lipstick. Treat yo self! Lobster roll and oysters with friends for dinner. Treat yo self! Pinkberry with mochi and strawberries. Treat yo self! This won’t always happen but damnit, it’s time to embrace this. I plan to shout “Treat yo self” to people randomly now. Because I’m a big fan of this. Plus, Parks and Rec is just awesome. This and DJ Roomba seriously make me happy. How are you going to Treat yo self this week? I consider myself to be a pretty optimistic lady. I’m “glass half full” all the time, but lately I’ve been a bit more of a Debbie Downer. Okay, maybe not THAT bad, but maybe a little bit of a Wallowing Winnie. So that’s why I’ve been a little slow in posting lately. Once I get over this Debbie Downer/Wallowing Winnie hump, I will be back to being me, and being a little more regular in posts. Guess who is making Thanksgiving dinner? THIS GIRL and my SIL!! For as long as I can remember, my grandma made the Thanksgiving meal. Turkey, stuffing, pumpkin pie, cranberry relish and the best mashed potatoes and gravy. I have a lot of fond memories sitting at their house, watching football and stuffing myself until I have a three month food baby. But now that my grandma is older, it’s a lot for her to do, and this weekend, she bittersweetly relinquished the Thanksgiving title. And it really is bittersweet because it’s another sign of change, but one that my SIL and I gladly jumped on. Yes, we VOLUNTEERED to cook Thanksgiving for that part of our family. VOLUNTEERED. I’ll say that again because I had an initial moment of fear and then, excitement. And I’m still so excited about this…and scared. My SIL and I will be cooking family favorites, but mixing it up a bit too. So far, we’ve discussed adding a sweet potato dish, appetizers (since we’ll eat a little later) and I have made it my mission to find an amazing green bean casserole recipe. The only big decision we still have to make is: make the turkey ourselves or purchase one premade? I won’t lie, doing a fully homemade turkey freaks me out a little bit. But, I have plenty of time to get my questions answered and feel more secure in what we’re making. Martha Stewart and Pioneer Woman, I’ve got my eye on you women to help me through this. And I’m hoping it won’t become an episode of My Drunk Kitchen (no promises). Who traditionally cooks your Thanksgiving meal?